For the past three years, the Silver Scream Film & Comic Festival has allowed AGP to discover scripts and graphic novels that might not otherwise be on our radar. In 2017, the Best Graphic Novel Script award went to Matt Dreiling‘s stark depiction of a farming family in the Midwest during the Great Depression. Dreiling said, “I wrote BLACK SUNDAY after I moved to Montana with my girlfriend. I was unemployed for several months, so I had time to explore a few story ideas that had been haunting me. My grandparents were farm teenagers in western Kansas during the Dust Bowl, and growing up, we would visit them for Christmas. My grandfather would tell these fantastic tales of hardship and how the dust storms made them think the apocalypse was upon them. When we approached Polychrome about the project, her character designs made it clear that she could empathize with a young family in a desperate situation. Her smooth inks paired with occasional accents of morbid red turn the story into an atmospheric wonder. We sat down with the artist to chat about her professional comics debut and creative background. American Gothic Press. Your artistic background lies in portraiture and illustrating for various fandoms. What has the transition to sequential art been like? Is your process very different? Polychrome. Although I have a degree in Fine Art, I was a fashion designer for many years. I fell into doing portraiture and fan art about 3 years ago. I find that sort of art similar to sequential art in that it’s important to make sure the people you’re drawing are recognizable every time. But drawing single portraits, even if I draw the same character 100 times, is much less complex than making sure characters look the same over dozens of pages that are meant to be looked at together, while simultaneously laying a story out that allows a reader to follow along from panel to panel. In comics, so much has to be summed up about the characters and their story in each panel. The art I do for fics is, essentially, a nice addition to the stories, but here the author is relying on my art to tell their story. AGP. What are some influences that have led to the development of your style? PC. I remember learning to draw by copying Albrecht Dürer and Howard Pyle out of my father’s book collection. I later became obsessed with Aubrey Beardsley, Kay Nielsen, John R. Neill, and Charles Robinson — again, through book illustrations. When I discovered fashion design, I was still very much enamored of that time period, and artists like Erté and George Barbier, both of whom inspired my fashion illustrations. I’ve always loved the delicately drawn figures and fine detail these artists were able to capture, and how much their drawings enhanced the books I read. AGP. What techniques have you found helpful in illustrating BLACK SUNDAY in particular? Do you have to deviate from the script at all? PC. I felt as though the characters’ facial expressions and body language were really important to telling the story, and the best way to translate their emotions was by keeping the lines really simple. This also let the backgrounds stand out more as they’re not competing for the readers’ focus in every panel. I haven’t had to deviate much –– maybe an added panel here and there –– probably because the author comes from a cinematography background. He really has a good sense of what a suspenseful story needs, visually, so I had a great platform to work from. AGP. What are your digital drawing essentials? PC. I’m actually quite new to digital art, having always done everything traditionally. But I love how flexible and open-ended digital art is. I work on a Mac and use a Wacom Intuous Pro and Sketchbook Pro for almost all of my digital art. 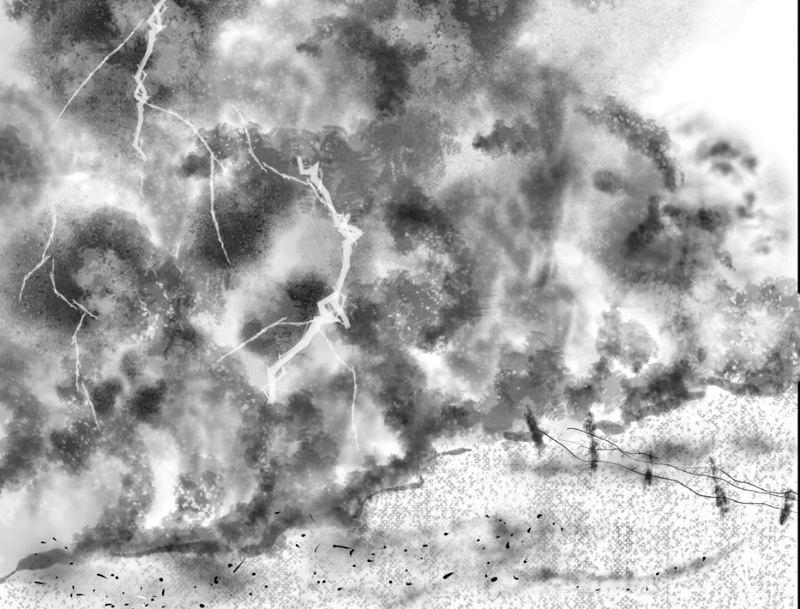 I tend to work with very basic brushes like manga pens, but because BLACK SUNDAY has a lot of background detail, I’ve been experimenting with textured brushes as well to give life to things like trees and dust storms. AGP. 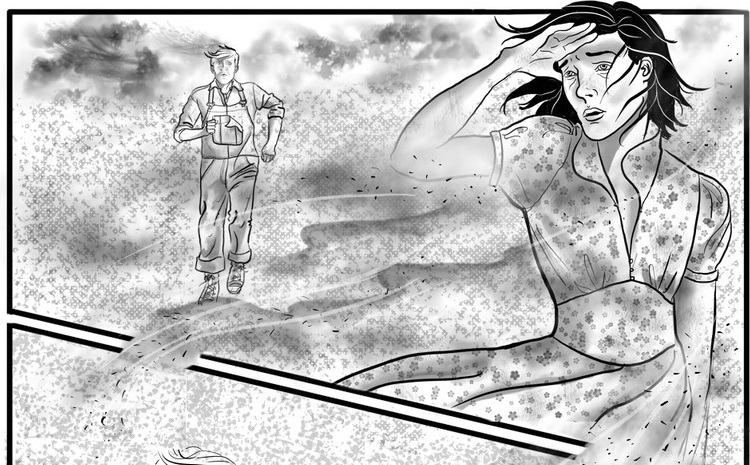 About that background detail… BLACK SUNDAY is full of desolate landscapes from the Dust Bowl era. How much research have you done? Has anything really surprised you? PC. Strangely enough, I’ve been fascinated by the Dust Bowl for ages. I remember seeing the Ken Burns documentary years ago, and I re-watched it when I started working on this project. The almost unimaginable combination of disasters of the time period is heartbreaking from a human standpoint, and fascinating from a historical perspective. Although I had a basic working knowledge of the events, I had to do a fair amount of research on a lot of random things, like what patterns were popular on wallpaper, or what milk cans looked like. But researching the landscapes and the Depression-era home interiors was really moving. I don’t think most people today can fully comprehend how devastating this time period was, or how desperate people became. Looking back on it is very different from living through a decade of drought and dust and poverty and not knowing if it would ever end. People truly thought it was the End of Times. AGP. If you had a dream project, what would it be? PC. Oh, that’s a hard one. 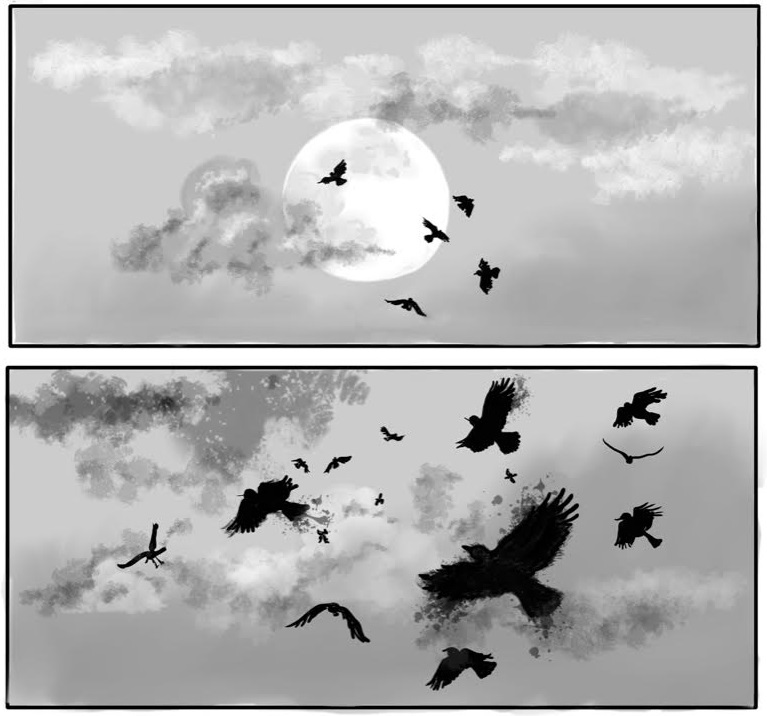 I’m working with an author I’ve partnered with before on a fan comic at the moment, and I’m really loving that. It’s all in color and has a lot of action/adventure scenes, so it’s a great challenge for me. I’d love to do a slash graphic novel outside of fandom, so maybe that’s something I’ll eventually do. And doing illustrations for books, like the ones I read when I was younger, would be amazing. AGP. Tell comic readers: why should they read BLACK SUNDAY? PC. I think what I love most is that it’s a story set in a time period of intense hardship and self-preservation, so right off the bat everyone is on edge, which makes for good storytelling! Remember that many people who lived through the dust bowl truly thought the world was coming to an end. People at the time were frequently driven mad by fear, stress, and what really could be seen as almost relentless psychological torture. So you begin the first volume already wondering if these people will survive at all, and what they will endure if they do manage to make it through. BLACK SUNDAY will be hitting digital platforms in 2019 as a four-issue mini-series, and we’ll be sharing more sneak peaks and exclusive content until then!